Hey Everyone...I am sure you have already seen pics of me and the other fabulous bloggers who got a chance to meet Rani Mukherjee at a special screening of the film Mardaani at Yash Raj Studios. But I wanted to document what I wore for this event and so the post. I had decided I would wear a black sheer saree that I absolutely adore, but I changed my plans on the last day. Because I thought it was better to choose Function over Fashion for this event. So I decided to put together a functional outfit that is not only comfortable but also stylish. Black Trousers for the formal element, added in a polka dot top for some fun, a double strand pearl necklace for elegance and red lips for some glamor. Ooh...And I forgot to take pics of the bag, so cropped this from a group pic. Nail Colours used: Sally Hansen's Black Out, White On and Clear Polish. Also used Nail Art stickers. I also flaunted this monochrome nail art, which I attempted after a long hiatus. I am loving that scarf that is tied to your bag. Lovely! Elegant and classy😊 love it! 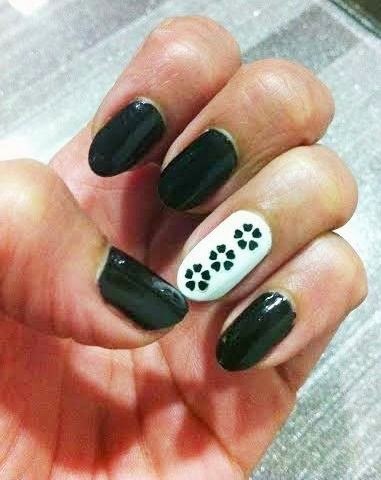 love the polka dots..and the nail art is awesome! how do you do it so neatly? where is the pic with Rani Mukherjee ? Thnks Prerana..pics with rani...coming soon. U look cool in western wear too, try that more often . Love the style of this blouse , polka is definitely your thing !